How cute, big sister and newborn sister joined by two bracelets. What will big sister rays of pride! Made of bright white pearls, pink crystals and two silver graveerbedeltjes. How special, a bead with a message for your dad, your son or (tough) mom or daughter. Engrave a name, kind word or date on graveerbedel. What they will sparkle with this festive bracelet around her wrist! Made of bright white pearls, pink Swarovski crystals and pearl stars. Comes in a pink silk pouch, as ready to give. How special, grandma, mom and granddaughter all wearing the same bracelet with a liefdevolel text. At the children's bracelet is engraved very precisely: love you ♡. And the mom and grandma 'to the moon & back "♡. What will you shine! Sweet bracelet, that not only mommy, but also daughter sweet will be good. The infinity sign - which stands for infinite love - has room for an engraving of word, name or dates of your choice. In addition, the bracelet is easy to adjust, so that you can . Beautiful personal bracelet with an Infinity symbol (occupied with zirconia) and one or more birth crystals. Door-and-door silver, forever beautiful.Every birth month has its own birthstone, available in 12 beautiful colors. This extra luxurious bracelet is a true show off pieces: Shimmering hand knotted ivory pearls swap the pink Swarovski crystals and sweet rings off. On the bracelet hangs a sphere center, symbolic of the sweetest girl! Beautiful bracelets made of shiny AAA quality lavender pink pearls, twinkling light pink crystal and silver rings. At the children's bracelets is a sweet heart ball. Perfect gift for little princes pearl! These bracelets are true ceremonial pieces: Glittering AAA quality ivory pearls, Swarovski crystals and sweet rings. Depends on both a silver bracelets cute butterfly. heart. Quite the same as mama, how sweet is that! These bracelets are designed for tough Dad & son. Made of black onyx beads with silver stars. What will you shine together! 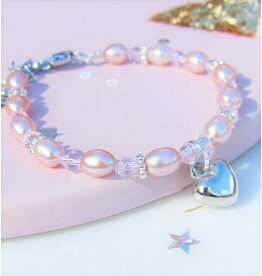 You must be her most beautiful christening gift with this sweet bracelet. Made of bright white freshwater pearl, pink crystal and silver elements. By charm "Baptism 2014 'a lasting memory. Sweet Child Sterling Silver Bracelet made of genuine freshwater pearls, Swarovski crystals and silver rings. 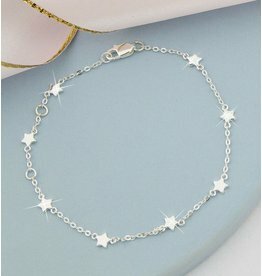 Is the silver heart on the bracelet hangs symbol for all-sweetest girl. My bestseller of the whole shop! Probably due to the wonderful combination of AAA quality ivory white pearls interspersed with Swarovski crystals and rings. On the bracelet hangs a sphere center, symbolic of the sweetest girl. After many requests here the first brother & sisters set of KAYA! Designed by my son Daniel and daughter Sanne, to be connected together. How sweet is that? With sweet shell beads for hair and jet black onyxkralen for him. What this beautiful bracelet will assist her white dress! Made of white freshwater pearls, silver flowers and clear Swarovski crystals (with rainbow glow when light falls). Sweet packaged, ready-made gift.